I am a jack of all trades and outdoors enthusiast currently exploring the paths of life. I enjoy expressing my appreciation of nature in my artwork. During my time at Alfred University I was able to take several advanced art classes including glass casting and metal work. I was able to greatly advance my knowledge and creative ability. I graduated Alfred University with a political science degree and hope this gives me unique breadth of knowledge as an artist. My sculpture expresses the energy and forms found in nature. I am currently exploring the application of high voltage electricity to produce art. 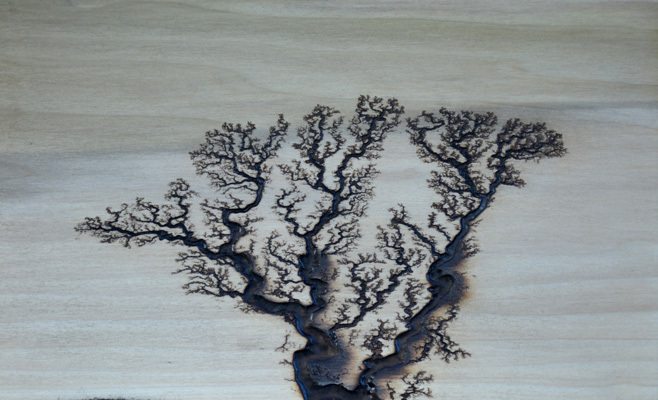 I have labeled my main series High Voltage Pyrography, and it is also known as Lichtenberg Figures. I create electrical discharge patterns similar to lightning strikes. Working with lower voltage and longer discharge times allows me to design the patterns. This fractal pattern represents the breakdown of insulating material into carbon. 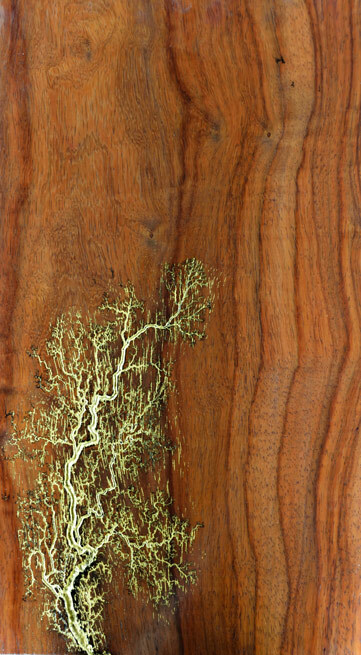 A water based solution is used to coat the surface of the wood and increase the conductivity to the point where a 2000 volt transformer will create an arc across the surface.